I'm a shower person, hands down. When I was away in Italy, and the Up You Gets Emotibomb shower bomb came into the Lush kitchen, my friend Michala was kind enough to snap one up for me. I'd never heard of it before, so I had absolutely no idea what to expect. The listed ingredients included lemon, lime and grapefruit oils, and citrus scents are my absolute favourite when it comes to bath and shower products. From the reviews I've read, people have said that it's best to put the shower bomb on the floor of the bath and let it dissolve. I didn't fancy letting mine wash straight down the drain, so I put it into the soap dish on the wall, and let the water gradually hit it so it didn't all dissolve straight away. As I started washing my hair, I found I couldn't smell the bomb, and I got a little bored of waiting, so I ended up picking it up and holding it while it dissolved slowly. The scent was super strong, almost overpowering at first, but I found as I continued showering, it was masked by any other products I was using. I really, really wanted to like this, but personally, I don't see the point in the shower bomb. 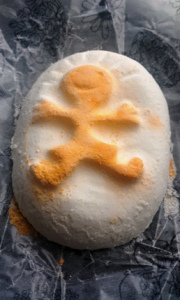 Isn't the point of a bath bomb, and most Lush products, to leave you smelling wonderful and feeling pampered? It doesn't permeate your skin, nor does it nourish in any way. It smelled absolutely divine, and it just felt so wasteful! If it were to become available again, I would rather buy this to place it somewhere in the apartment to freshen up one of the rooms. 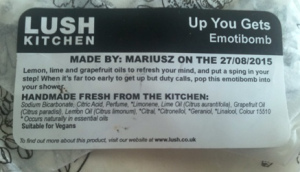 It really pains me to give a bad review to a Lush product, but this just didn't impress me. Sorry!